About a week back, our guide from Tadoba Andhari Tiger Reserve rang up my son Bharat Goel to visit Kolsa Range and Buffer Zone of Moharli Range as good sightings of two tigresses with cubs of 4 to 5 months and 1 ½ Years, are regularly taking place. I took Tamil Nadu Sampark Kranti train in the morning of 26th Feb, 2015 and was to reach at Nagpur at 12:00 pm (after about 17 hours). The train reached at 02:00 am. At the Nagpur platform 4 senior officers of Nagpur Customs and Central excise commissionerate were waiting to welcome me. All these officers had worked with me while I was posted at Raipur (Capital of Chhattisgarh) from 2002 to 2008. I was obliged by the honor given to me. After deboarding from the train we proceeded to departmental Guest House at Civil Lines. After having tea with them, I went to sleep. I woke up at 06:00 am and was ready for my onward journey to Chandrapur, from where I was to be picked up by my guide. From there we went to Kolsa Forest Rest House through Zhari Gate (about 40 km from Chandrapur). After reaching Forest Rest House at Kolsa, just adjacent to Kolsa Village, we prepared ourselves for the 1st afternoon safari. Although safari timing was from 02:00 pm but we proceeded at 2:30 pm. We saw a cattle egret with live snake (picked up on road) on Kolsa – Rantalodi road. It was afternoon and from where the snake came was a mystery. His death invited him to become food for cattle egret. 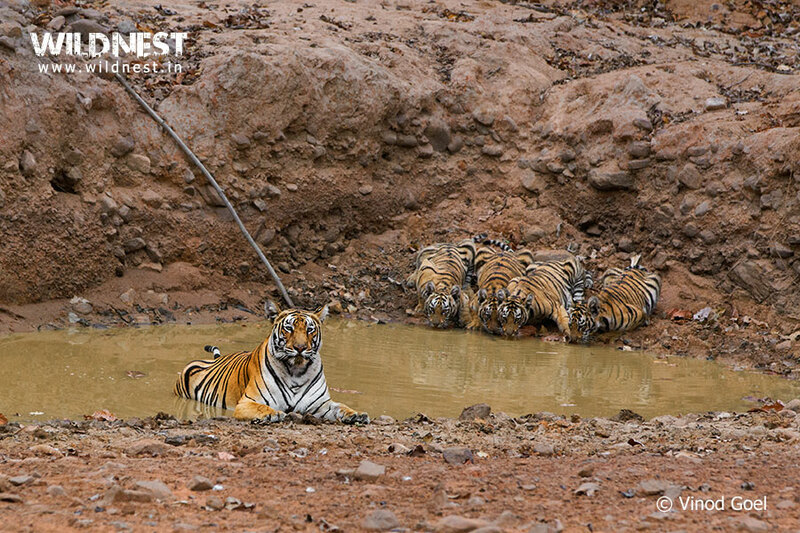 In the evening we were fortunate to sight tigress with 4 cubs at the waterhole on Kuhani ain-bodi (water hole). My first sighting of life where I saw 4 cubs of 4 to 5 months old with their mother, at a distance of about 30 to 40 meters, in absolutely clear surroundings. Again we saw the same family on 28th Feb. All 4 cubs quenching their thirst, while the mother was watching them. What a sight! However efforts to see the same family in the coming days on 1st and 2nd March didn’t bring any result on account of rain. On 2nd March morning, we were fortunate to track a huge male tiger for about 2 hrs, based on pug marks, alarm calls from a Sambar deer and guides knowledge about topography of the forest. Later on we were fortunate to have glimpses of a tigress crossing the road in a hurry. We left Kolsa range after the evening safari and reached Forest Guest House at Moharli village via Chandrapur. After spending morning safari time with students of Wildlife Institute of india in the Tadoba Range, went out to the Dewada area of Buffer Zone in the afternoon safari. We were fortunate to sight 4 cubs (1 ½ Yrs old). The 3 cubs had almost surrounded our vehicle. They were hardly 6-7 meters from the vehicle. The male tiger cub was about 60 – 70 meters and the mother was not visible. In the morning safari on 4th march, I could see the Telia Tigress along with 3 cubs. Telia tigress is known as Madhuri and she was the shining star of Moharli range. It was ousted by her daughter from the Moharli core area about two years back i.e. 2013. I remember, I had seen her in 2012 at water tank no. 2 with her 4 cubs. On 4th March 2015, I had memorable shots of the family. By the time I left the park, I was completely satisfied with my visit. Almighty showed me 12 different tigers during my stay of 10 safaris. What else could I have asked for? I boarded Tamil Nadu Rajdhani Express train from Nagpur at 3:30 pm on 4th March and reached Delhi in the morning of 5th March. On reaching home my family could see real happiness visible on my face. Click here to see more Tadoba Andhari Tiger Reserve Photos.